CHAROTTE OFFERS VETERANS DAY TRIBUTES | South Charlotte Newcomers! LAND OF THE FREE – We owe it to YOU, Veterans!! Veterans Day is the time to remember those who have sacrificed so much to protect our country and our freedom. Veterans Day gives us an opportunity to pay tribute and sincere appreciation to the people who have ensured the liberties we cherish as American citizens. Charlotte supports our men and women of the Armed Forces through many organizations and services who deserve public acknowledgement on Veterans Day. Opportunities of praise and celebration for our Vets will be available throughout the Charlotte area November 9-11. On Sunday, November 11 at 1:00 p.m. at Bank of America Stadium is another all-American sporting event – Carolina Panthers football http://www.panthers.com. They too will be hosting a Military Appreciation Day which is always moving and wonderfully done. And finally, if you’d prefer to quietly reflect on our nation’s veterans, visit the Mecklenburg County Vietnam Veterans Memorial 1129 E 3rd St in Charlotte. www.charlottevietnammemorial.org The Memorial is now accessible from the Sugar Creek Greenway in uptown Charlotte. Visit the memorial and walk the 270-foot granite arc while reading the historical timeline; view a map of Southeast Asia during the war; honor the names of those from Mecklenburg County who died; experience the war through the poems of a Vietnam veteran; and, pause to reflect at the American and POW/MIA flags. Charlotte citizens have a time-honored tradition of honoring those who have served to protect our country. Whether it is singing, cheering or quiet thanks, Charlotteans have the opportunity to recognize and honor our veterans. 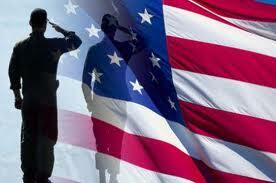 God bless America, and God bless our Vets.